Fans and collectors of Harry Potter and J. K. Rowling's Wizarding World will love this one-of-a-kind talking collectible of the free elf, Dobby. Kit includes : * 3-inch figure of Dobby, mounted on a base. He speaks memorable lines from the Harry Potter films at the push of a button. * 48-page book full of quotes and fuLearn the art of modern hand lettering, and create adorable banners, with By Hand :A Modern Lettering Kit! 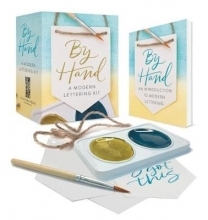 This kit includes : * Miniature watercolor brush. * Two pots of watercolor paint. * 10 miniature banner sheets, with holes for hanging. * 20 printed, instructional art paper cards.